Greco-Buddhist art is the artistic manifestation of Greco-Buddhism, a cultural syncretism between the Classical Greek culture and Buddhism, which developed over a period of close to 1,000 years in Central Asia, between the conquests of Alexander the Great in the 4th century BC, and the Islamic conquests of the 7th century AD. Greco-Buddhist art is characterized by the strong idealistic realism and sensuous description of Hellenistic art and the first representations of the Buddha in human form, which have helped define the artistic (and particularly, sculptural) canon for Buddhist art throughout the Asian continent up to the present. It is also a strong example of cultural syncretism between eastern and western traditions. The origins of Greco-Buddhist art are to be found in the Hellenistic Greco-Bactrian kingdom (250–130 BC), located in today’s Afghanistan, from which Hellenistic culture radiated into the Indian subcontinent with the establishment of the Indo-Greek kingdom (180–10 BC). Under the Indo-Greeks and then the Kushans, the interaction of Greek and Buddhist culture flourished in the area of Gandhara, in today’s northern Pakistan, before spreading further into India, influencing the art of Mathura, and then the Hindu art of the Gupta empire, which was to extend to the rest of South-East Asia. The influence of Greco-Buddhist art also spread northward towards Central Asia, strongly affecting the art of the Tarim Basin, and ultimately the arts of China, Korea, and Japan. The clearest examples of Hellenistic art are found in the coins of the Greco-Bactrian kings of the period, such as Demetrius I of Bactria. Many coins of the Greco-Bactrian kings have been unearthed, including the largest silver and gold coins ever minted in the Hellenistic world, ranking among the best in artistic and technical sophistication: they "show a degree of individuality never matched by the often more bland descriptions of their royal contemporaries further West". ("Greece and the Hellenistic world"). These Greek elements penetrated India quite early as shown by the Hellenistic Pataliputra capital (3rd century BC), but the influence became especially strong, particularly in northwestern India, following the invasion of the Greco-Bactrians in 180 BC, when they established the Indo-Greek kingdom in India. Fortified Greek cities, such as Sirkap in northern Pakistan, were established. Architectural styles used Hellenistic decorative motifs such as fruit garland and scrolls. Stone palettes for aromatic oils representing purely Hellenistic themes such as a Nereid riding a Ketos sea monster are found. The Greeks in Asia are well known archaeologically for their stone palettes, also called "toilet trays", round trays commonly found in the areas of Bactria and Gandhara, which usually represent Greek mythological scenes. The earliest of them are attributed to the Indo-Greek period in the 2nd and 1st century BCE (a few were retrieved from the Indo-Greek stratum No.5 at Sirkap). Production continued until the time of the Indo-Parthians, but they practically disappeared after the 1st century. Nereid goddess riding a Ketos sea-monster, 2nd century BCE, Sirkap. Mythological scene with Athena and Herakles. Poseidon with attendants. Ancient Orient Museum. Man with cup in hand, riding a Ketos sea-monster. As soon as the Greeks invaded Northwestern South Asia to form the Indo-Greek kingdom, a fusion of Hellenistic and Buddhist elements started to appear, encouraged by the benevolence of the Greek kings towards Buddhism. This artistic trend then developed for several centuries and seemed to flourish further during the Kushan Empire from the 1st century AD. 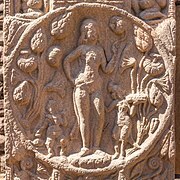 According to some authors, Hellenistic sculptors had some connection with the creation of Buddhist art at Sanchi and Bharhut. The structure as a whole as well as various elements point to Hellenistic and other foreign influence, such as the fluted bell, addorsed capital of the Persepolitan order, and the abundant use of the Hellenistic flame palmette or honeysuckle motif. Around 115 BC, the embassy of Heliodorus from king Antialkidas to the court of the Sungas king Bhagabhadra in Vidisha is recorded. In the Sunga capital, Heliodorus established the Heliodorus pillar in a dedication to Vāsudeva. This would indicate that relations between the Indo-Greeks and the Sungas had improved by that time, that people traveled between the two realms, and also that the Indo-Greeks readily followed Indian religions. Also around the same time, circa 115 BC, it is known that architectural decorations such as decorative reliefs started to be introduced at nearby Sanchi, 6 km away from Vidisha, by craftsmen from the area of Gandhara, a central Indo-Greek region. Typically, the earliest medallions at Sanchi Stupa No.2 are dated to 115 BC, while the more extensive pillar carvings are dated to 80 BC. These early decorative reliefs were apparently the work of craftsmen from the northwest (around the area of Gandhara), since they left mason's marks in Kharoshthi, as opposed to the local Brahmi script. This seems to imply that these foreign workers were responsible for some of the earliest motifs and figures that can be found on the railings of the stupa. Foreigner on a horse. The medallions are dated circa 115 BC. Lotus within Hellenistic beads and reels motif. At Bharhut, the gateways were made by northern (probably Gandharan) masons using Kharosthi marks, while the railings were made by masons exclusively using marks in the local Brahmi script. 150-100 BC. Craftsmen from the Gandhara area, a central region of the Indo-Greek realm, are known to have been involved in the construction of the gateways at Bharhut, which are dated to 100-75 BC: this is because mason's marks in Kharosthi have been found on several elements of the Bharhut remains, indicating that some of the builders at least came from the north, particularly from Gandhara where the Kharoshti script was in use. Cunningham explained that the Kharosthi letters were found on the ballusters between the architraves of the gateway, but none on the railings which all had Indian markings, summarizing that the gateways, which are artistically more refined, must have been made by artists from the North, whereas the railings were made by local artists. 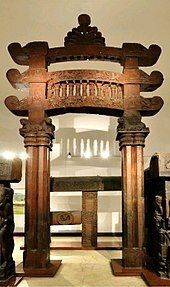 The Bharhut gateway is dated to 100-75 BC (most probably 75 BC based on artistic analysis). The structure as a whole as well as various elements point to Hellenistic and other foreign influence, such as the fluted bell, addorsed capital of the Persepolitan order, and the abundant use of the Hellenistic flame palmette or honeysuckle motif. Left image: Classical Greek Corinthian anta capital. Right image: An Indo-Corinthian capital with a palmette and the Buddha at its centre, 3-4th century, Gandhara. The story of the Trojan horse was depicted in the art of Gandhara. British Museum. Later, Greco-Buddhist art depicts the life of the Buddha in a visual manner, probably by incorporating the real-life models and concepts which were available to the artists of the period. Stucco as well as stone was widely used by sculptors in Gandhara for the decoration of monastic and cult buildings. Stucco provided the artist with a medium of great plasticity, enabling a high degree of expressiveness to be given to the sculpture. Sculpting in stucco was popular wherever Buddhism spread from Gandhara - India, Afghanistan, Central Asia and China. Stylistically, Greco-Buddhist art started by being extremely fine and realistic, as apparent on the standing Buddhas, with "a realistic treatment of the folds and on some even a hint of modelled volume that characterizes the best Greek work" (Boardman). It then lost this sophisticated realism, becoming progressively more symbolic and decorative over the centuries. Later in Hadda, the Greek divinity Atlas is represented holding Buddhist monuments with decorated Greek columns. The motif was adopted extensively throughout the Indian sub-continent, Atlas being substituted for the Indian Yaksa in the monuments of the Shunga Empire around the 2nd century BC. 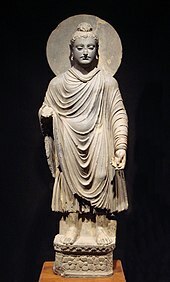 One of the first representations of the Buddha, 1st–2nd century AD, Gandhara, Pakistan: Standing Buddha (Tokyo National Museum). The Seated Buddha, dating from 300 to 500 CE, was found near Jamal Garhi, Pakistan, and is now on display at the Asian Art Museum in San Francisco. Foucher especially considered Hellenistic free-standing Buddhas as "the most beautiful, and probably the most ancient of the Buddhas", assigning them to the 1st century BC, and making them the starting point of the anthropomorphic representations of the Buddha ("The Buddhist art of Gandhara", Marshall, p101). The Bimaran casket, representing the Buddha, is dated to around 30–10 BC. British Museum. There is some debate regarding the exact date for the development of the anthropomorphic representation of the Buddha, and this has a bearing on whether the innovation came directly from the Indo-Greeks, or was a later development by the Indo-Scythians, the Indo-Parthians or the Kushans under Hellenistic artistic influence. Most of the early images of the Buddha (especially those of the standing Buddha) are anepigraphic, which makes it difficult to have a definite dating. The earliest known image of the Buddha with approximate indications on date is the Bimaran casket, which has been found buried with coins of the Indo-Scythian king Azes II (or possibly Azes I), indicating a 30–10 BC date, although this date is not undisputed. Such datation, as well as the general Hellenistic style and attitude of the Buddha on the Bimaran casket (himation dress, contrapposto attitude, general depiction) would make it a possible Indo-Greek work, used in dedications by Indo-Scythians soon after the end of Indo-Greek rule in the area of Gandhara. Since it already displays quite a sophisticated iconography (Brahma and Śakra as attendants, Bodhisattvas) in an advanced style, it would suggest much earlier representations of the Buddha were already current by that time, going back to the rule of the Indo-Greeks (Alfred A. Foucher and others). The next Greco-Buddhist findings to be strictly datable are rather late, such as the c. AD 120 Kanishka casket and Kanishka's Buddhist coins. These works at least indicate though that the anthropomorphic representation of the Buddha was already extant in the 1st century AD. From another direction, Chinese historical sources and mural paintings in the Tarim Basin city of Dunhuang accurately describe the travels of the explorer and ambassador Zhang Qian to Central Asia as far as Bactria around 130 BC, and the same murals describe the Emperor Han Wudi (156–87 BC) worshipping Buddhist statues, explaining them as "golden men brought in 120 BC by a great Han general in his campaigns against the nomads." Although there is no other mention of Han Wudi worshipping the Buddha in Chinese historical literature, the murals would suggest that statues of the Buddha were already in existence during the 2nd century BC, connecting them directly to the time of the Indo-Greeks. An Indo-Chinese tradition also explains that Nagasena, also known as Menander's Buddhist teacher, created in 43 BC in the city of Pataliputra a statue of the Buddha, the Emerald Buddha, which was later brought to Thailand. In Gandharan art, the Buddha is often shown under the protection of the Greek god Herakles, standing with his club (and later a diamond rod) resting over his arm. This unusual representation of Herakles is the same as the one on the back of Demetrius' coins, and it is exclusively associated to him (and his son Euthydemus II), seen only on the back of his coins. Various fantastic animal deities of Hellenic origin were used as decorative elements in Buddhist temples, often triangular friezes in staircases or in front of Buddhist altars. The origin of these motifs can be found in Greece in the 5th century BC, and later in the designs of Greco-Bactrian perfume trays as those discovered in Sirkap. Among the most popular fantastic animals are tritons, ichthyo-centaurs and ketos sea-monsters. 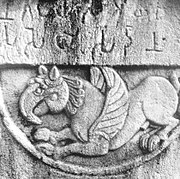 Similar fantastic animals are found in ancient Egyptian reliefs, and might therefore have been passed on to Bactria and India independently. As fantastic animals of the sea, they were, in early Buddhism, supposed to safely bring the souls of dead people to Paradise beyond the waters. These motifs were later adopted in Indian art, where they influenced the depiction of the Indian monster makara, Varuna's mount. A Buddhist coin of Kanishka I, with "Boddo" (=Buddha) in Greek script. 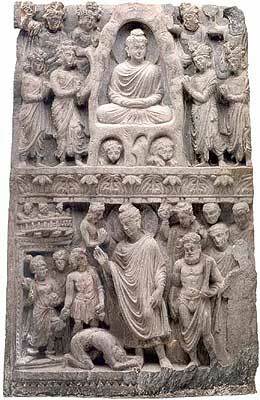 The later part of Greco-Buddhist art in northwestern India is usually associated with the Kushan Empire. The Kushans were nomadic people who started migrating from the Tarim Basin in Central Asia from around 170 BC and ended up founding an empire in northwestern India from the 2nd century BC. After conquering the lands once inhabited by Greco-Bactrians and Indo-Greeks, the Kushan Empire adopted Greco-Buddhist art. Kushans worshipping the Buddha's bowl. 2nd century Gandhara. The "Kanishka casket," with the Buddha surrounded by Brahma and Indra, and Kanishka on the lower part, AD 127. Balustrade-holding Yaksa with Corinthian columns, Madhya Pradesh (? ), Shunga period (2nd-1st century BC). Musee Guimet. 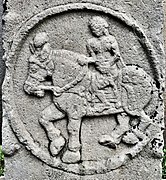 Indian relief of probable Indo-Greek king, with Buddhist triratana symbol on his sword. Bharhut, 2nd century BC. Indian Museum, Calcutta. Examples of the influence of Hellenistic or Greco-Buddhist art on the art of the Shunga Empire (183-73 BC) are usually faint. The main religion, at least at the beginning, seems to have been Brahmanic Hinduism, although some late Buddhist realizations in Madhya Pradesh as also known, such as some architectural expansions that were done at the stupas of Sanchi and Bharhut, originally started under King Ashoka. In terms of artistic predispositions for the first representations of the Buddha, Greek art provided a very natural and centuries-old background for an anthropomorphic representation of a divinity, while on the contrary "there was nothing in earlier Indian statuary to suggest such a treatment of form or dress, and the Hindu pantheon provided no adequate model for an aristocratic and wholly human deity" (Boardman). The Mathura sculptures incorporate many Hellenistic elements, such as the general idealistic realism, and key design elements such as the curly hair, and folded garment. Specific Mathuran adaptations tend to reflect warmer climatic conditions, as they consist in a higher fluidity of the clothing, which progressively tend to cover only one shoulder instead of both. Also, facial types also tend to become more Indianized. Banerjee in Hellenism in ancient India describes "the mixed character of the Mathura School in which we find on the one hand, a direct continuation of the old Indian art of Bharhut and Sanchi and on the other hand, the classical influence derived from Gandhara". A terracotta head of Buddha Shakyamuni, inspired by Greco-Buddhist art, Devnimori, Gujarat (375-400 CE). The Buddha in long, heavy robe, a design derived from the art of Gandhara, Ajanta Caves, 5th century CE. It has been suggested that the art of Devnimori in Gujarat, dated to the 4th century CE, represented a Western Indian artistic tradition, based on the influence of the Greco-Buddhist art of Gandhara, that was anterior to the rise of Gupta Empire art, and that it may have influenced it, and have influenced the art of the Ajanta Caves, Sarnath and other places from the 5th century onward. Devnimori may also have received some influence from Mathura art. At Ajanta, some connections with the art of Gandhara can be noted, and there is evidence of a shared artistic idiom. The site of Devnimori included numerous terracotta Buddhist sculptures (but no stone sculptures), which are among the earliest sculptures that can be found in Gujarat. The style is clearly influenced by the Greco-Buddhist art of Gandhara. The Indo-Scythian Western Satraps (1st century CE-405 CE) may have played a role in the transmission of the art of Gandhara to the western Deccan region, as may also have the southern expansion of the Alchon Huns in the 6th-7th century. Greco-Buddhist artistic elements can be traced in Chinese Buddhist art, with several local and temporal variations depending on the character of the various dynasties that adopted the Buddhist faith. Some of the earliest known Buddhist artifacts found in China are small statues on "money trees", dated circa AD 200, in typical Gandharan style: "That the imported images accompanying the newly arrived doctrine came from Gandhara is strongly suggested by such early Gandhara characteristics on this "money tree" Buddha as the high ushnisha, vertical arrangement of the hair, moustache, symmetrically looped robe and parallel incisions for the folds of the arms." Various other Greco-Buddhist artistic influences can be found in the Japanese Buddhist pantheon, the most striking of which being that of the Japanese wind god Fujin. In consistency with Greek iconography for the wind god Boreas, the Japanese wind god holds above his head with his two hands a draping or "wind bag" in the same general attitude. The abundance of hair have been kept in the Japanese rendering, as well as exaggerated facial features. Wikimedia Commons has media related to Greco-Buddhist art. ^ a b Schastok, Sara L. (1985). The Śāmalājī Sculptures and 6th Century Art in Western India. BRILL. pp. 28–31. ISBN 9004069410. ^ a b Brancaccio, Pia (2010). The Buddhist Caves at Aurangabad: Transformations in Art and Religion. BRILL. p. 107. ISBN 9004185259. ^ Schastok, Sara L. (1985). The Śāmalājī Sculptures and 6th Century Art in Western India. BRILL. pp. 24–27. ISBN 9004069410. ^ "Musee Guimet and the Greek Buddhas of Gandhara". Minor Sights. 6 April 2014. Retrieved 2015-04-30. Ihsan Ali and Muhammad Naeem Qazi, Gandharan Sculptures in Peshawar Museum, Hazara University, Mansehra. Alfred Foucher, 1865-1952; Ecole française d'Extrême-Orient, L'art gréco-bouddhique du Gandhâra : étude sur les origines de l'influence classique dans l'art bouddhique de l'Inde et de l'Extrême-Orient (1905), Paris : E. Leroux.